This article was originally posted on the Melbourne Girl website (http://www.melbournegirl.com.au/2016/05/19/gofetch/#). I’m all about making my life easier, and couldn’t wait to try the new GoFetch app when I heard how simple it was to use. Haven’t heard of GoFetch before? I think the best way to describe the app is like an ‘Uber’ for couriers and delivery services – super simple, super user-friendly and super cost-effective! Designed and built in Melbourne, GoFetch is the brainchild of Melbourne ‘boy’ Blair Smith in 2015. 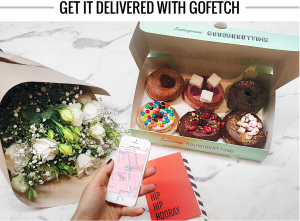 It was so simple to create my account and log-in using the GoFetch app, plug in my details and voila – I had my instant quote and a Fetcher at my door within 10 minutes! I could track every minute of my gift’s journey from my house to my bestie’s desk, so knew to the minute when it would be delivered. I also loved the fact that using GoFetch is super safe and available 24/7 – your items are guaranteed to $200, signatures are obtained and you’re not even charged until the item has been confirmed delivered. Plus all the Fetchers are police-checked, and you can track the delivery via GPS and talk with your Fetcher at any time. And it’s not just for picking up your dry-cleaning, or odd jobs and errands around the house – if you’re at work, and need to urgently get docs to a client, pick-up some supplies from Officeworks at the other end of the city or just need to know your life’s work is in safe hands, GoFetch is there for you. How can you start Fetching? Our friends at GoFetch are also offering $10 off your first fetch delivery. Simply set-up an account, book your first delivery and enter the code MELBGIRL by 31st May. Need some inspo for your first fetch? There’s so many ways you can use GoFetch, but I love the idea of using Fetchers to pick up coffees for a super-early morning meeting at work, or grabbing that new pair of jeans from your Alterations store before Friday night drinks. Whatever your sitch, GoFetch has got your back.